Beautiful cards! I am thankful for this wonderful hobby that gives me a creative outlet and a chance to use it to send love and caring to others. Thank you Judy. I enjoy being creative also and am so glad I get to create as a job and a hobby! 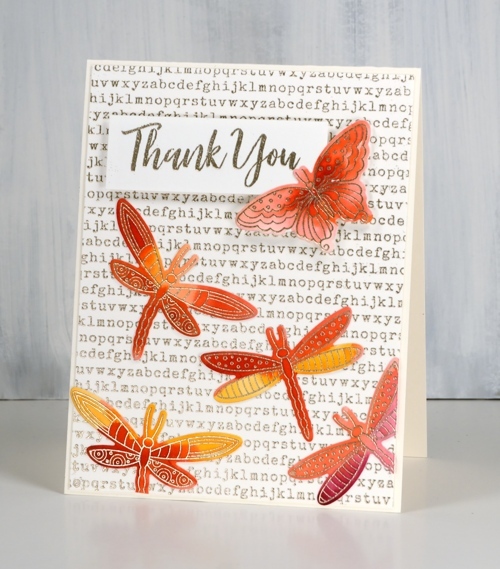 I love these cards… any cards with butterflies and dragonflies catch my eye. I am so grateful for my loving husband. I’m also thankful for my loving husband; such a blessing. Such pretty colors! Thank you for taking the time to share your talent with us! I am reminded by these cards of the creativity of the Creator who has made such a diversity of dragonflies and butterflies and am thankful for all that we see of His beauty in the world 🌎 around us. Dragonflies in particular always amaze me when I see them; their wings are irridescent. God has filled the world with beauty for us to enjoy. Seeing these cards make me thankful for bright colors and how beautifully orange, yellow and pink blend together! 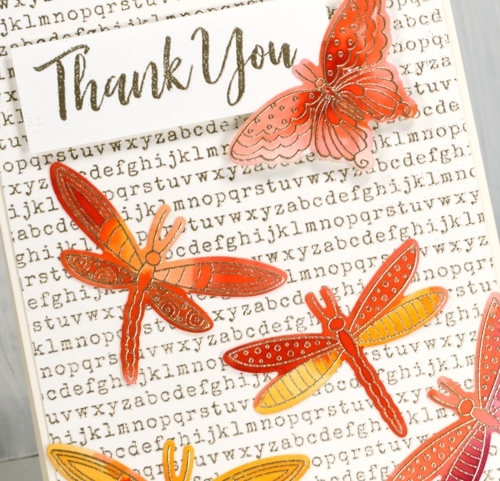 Butterflies and dragonflies also top my thankful list! If’s funny how once upon a time I would never have put orange and pink together; now it is one of my favourite colour combos. First, I am grateful to our Lord and Savior who loves us and shows us grace and mercy every day. Secondly, for you…your work is extraordinary. I learn from you each time I see one of your cards. And for you to take the time to write tutorials is amazing act of kindness to us.As a teacher, I know how tedious it is to write detailed instructions and techniques to someone you may never meet or see in person. Yet, each time, you so graciously take the time to explain. I have used your ideas many times, with such great success, not nearly as great as your work, but enough that the receiver of card is very appreciative. Thank you and may God always bless your creativity. So nice to hear from you Tish, thank you for your kind words about my blogging and for sharing what you are thankful for. May God bless you too. What beautiful cards! What I am most thankful for is my husband who is always right there when I need help. I know that he has just as many aches & pains as I do but he always takes careffect of me. So glad you have such a caring husband. Dragonflies are just rather magical, aren’t they? I have a dragonfly mobile, two dragonfly shirts, a framed Advice from a Dragonfly and a dragonfly necklace. I am so grateful for friends and family who gift me with meaningful treasures as well as their love and support. Dragonfly wings always amaze me, so delicate, often iridescent, just beautiful. 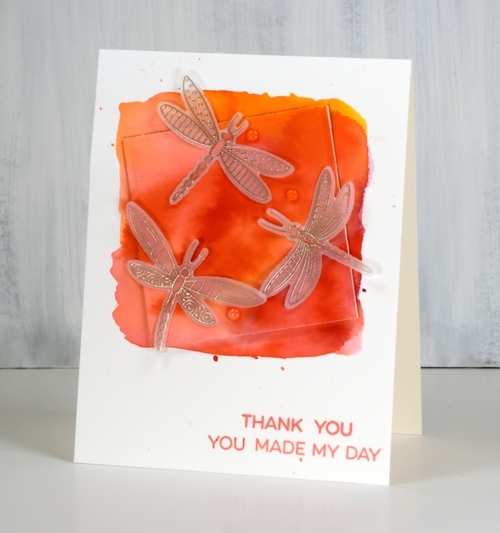 I love LOVE the type-background and dragonfly card! I am so thankful to God for the blessings of our little grandbabies that fill our hearts and lives with such sweet Joy! 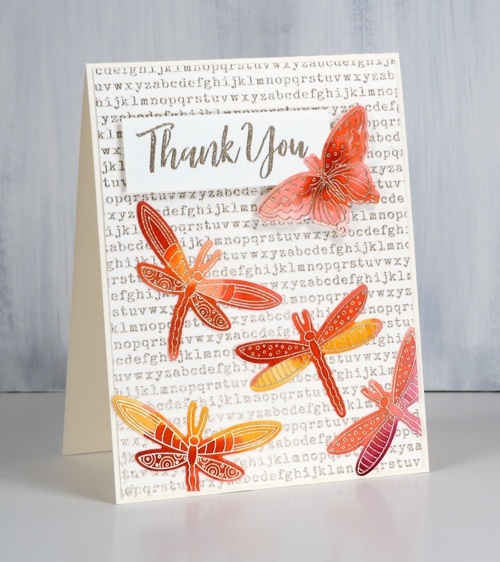 Great look with the dragonflies…I have this delightful stamp set and do enjoy the change in look from butterflies too! Your backgrounds are both unique…how did you get to be so creative – LOL!!! I am so thankful for your sweet words of encouragement and want you to know I am grateful! Beautiful cards, Heather! I love the gorgeous colored background on the first card & the typed background on number 2 is equally impressive. I’m thankful for all you awesome designers & the amazing techniques & creations you share with us here in blog land. So much great inspiration! Love, Love, love these. So happy and uplifting. I am thankful for all your beautiful posts. 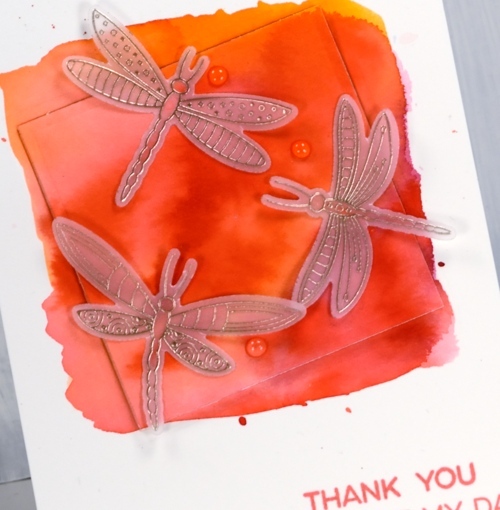 Fabulous dragonflies! I am thankful and grateful to the Lord for His faithfulness to see me through so many dark moments (health). I am grateful for people like you, Heather, who inspire me and help me to be more creative with my supplies. I love learning new techniques and reaching new levels of beauty in my cardmaking. Thank you so much for sharing your creative journey with the rest of us. Thank you for leaving this note. I am so happy to hear you are inspired here. Happy creating! I am thankful for all those in the crafting world who share their talents and their time. So pretty! Fall is the best of all! I am very thankful for each one of my children. I have 3 here with me on Earth and 1 in Heaven. Thank you Tamara. I am thankful for my children too; they bless me in so many ways. Gorgeous cards! I am thankful to be retired and now able to do more crafting! Thank you for your kind words. I should create a duo more often but I usually get distracted with another idea I want to try. I’m thankful for people like you and Foiled Fox sharing their talents and inspiration! Beautiful! I love these dragonflies! I’m always thankful that talented artists such as yourself so willingly share and inspire with your creations!